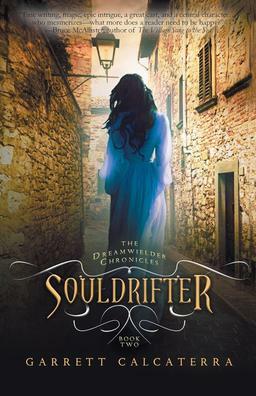 Black Gate is very pleased to offer our readers an exclusive excerpt from Souldrifter by Garrett Calcaterra, Book Two of The Dreamwielder Chronicles. The crew sprang into action around Taera, taking up their battle stations and readying their weapons… Giorgi had been forthright in admitting that naval battles never went to plan. That was doubly true with the Old World — they were bound to have their own tricks. Explosive weapons. Firewielders. Beastcharmers with whales or giant squids at their command. Stormbringers who could very well negate the Pyrthin stormbringers’ efforts and snuff out the wind altogether, leaving both fleets still in the water. If that happened, it would turn to hand-to-hand combat. The grappling hooks would come out and then the cutlasses. I hope you were right, Makarria, Taera thought as the enemy fleet loomed closer. The Old World armada was massive, easily outnumbering the Pyrthin fleet two vessels to one. And they weren’t backing down. Garrett Calcaterra is author of the YA fantasy series The Dreamwielder Chronicles. His other full-length books include The Roads to Baldairn Motte and Umbral Visions, and his short fiction and non-fiction has appeared places such as Wet Ink, Pirates & Swashbucklers 1 & 2, Membrane SF, Arkham Tales, and here at Black Gate. The complete catalog of Black Gate Online Fiction, including stories by John Fultz, Jon Sprunk, Tara Cardinal and Alex Bledsoe, E.E. Knight, Vaughn Heppner, Howard Andrew Jones, David Evan Harris, John C. Hocking, Michael Shea, Aaron Bradford Starr, Martha Wells, Nina Kiriki Hoffman, C.S.E. Cooney, and many others, is here. Souldrifter will be published by Diversion Publishing on September 29, 2015. It is 298 pages, priced at $15.99 in trade paperback and $4.99 for the digital edition. Learn more here. Read an exclusive excerpt from Souldrifter here.